Alex Davis caught sacks exceeding 20 pounds on each of the first 2 days. Two high-level tournaments have taken place at Lake Okeechobee since 2016 began and in neither did the famous Florida fishery show what it's capable of kicking out. The reason for that is weather � after a warm spell that lasted through December, the south-central portion of the Sunshine State has been beset by cold fronts and strong winds during recent weeks. 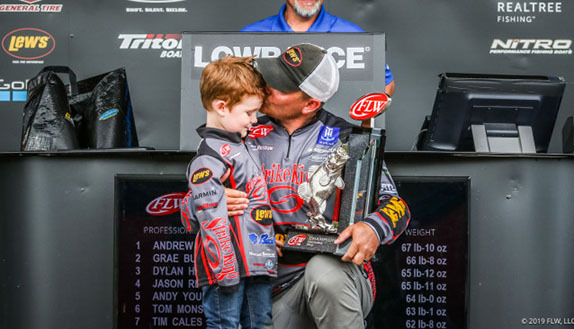 As a result, overall weights were relatively low for both the FLW Costa Series event in January (winner Jason Lambert averaged slightly under 15 pounds per day) and last week's FLW Tour Opener (nobody other than winner Bradley Hallman, who weighed back-to-back 25-pound stringers, averaged more than 14 a day). The Tour event featured 2 days on which the north wind exceeded 20 mph, and water temperatures fell throughout after a brief warm-up period that lasted through day 1. Competitors who fared well either located one or more of the clusters of quality fish that were scattered here and there across the 450,000-acre body of water or weeded their way through numerous 1- to 2-pounders in order to occasionally connect with one that weighed 3 or more. Here are some of the details about how Hallman's closest pursuers went about their business. 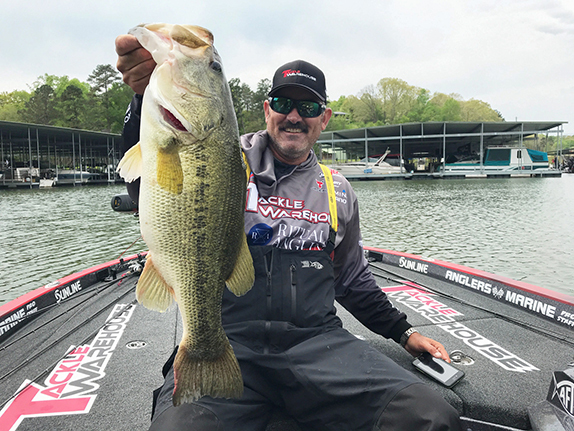 Alex Davis, a 4th-year pro who makes his primary living as a guide on Lake Guntersville, spent the entire tournament within a few miles of the launch ramp in Clewiston, Fla. He estimated that he burned less than 20 gallons of boat fuel over 4 days. He had little to no company in the small pocket that he fished. He flipped to bushes and made longer casts to holes in lily-pad fields. 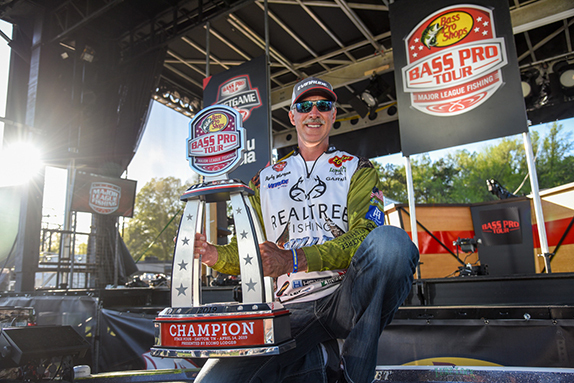 "The very first year I fished Okeechobee, one day I bet I had 60 bites throwing a (Reaction Innovations) Skinny Dipper in there," he said. "At that time I saw probably 200 beds in that area and I never forgot about it. I had the bites to get a check there 2 years ago, but they just wouldn't commit. "I was still pretty green about fishing in Florida back then. Since then I've learned some new tactics and I'm not so stubborn." His casts to the pad holes were lengthy � perhaps 20 or 25 yards on the average. Even while flipping, his best bet was to stay back as far as he could. At times he had to resort to flipping over obstacles such as tree branches, and then just taking his chances with landing the fish if he got bit. He caught every fish he weighed on a Jackall Flick Shake worm in the junebug color. He Texas-rigged it for flipping (using any of three different weight sizes, depending on the wind) and threw it weightless to the pad holes. > Weightless worm gear: 7'2" medium-heavy Shimano Zodias rod, Shimano Curado casting reel (7.2:1 ratio), 17-pound Seaguar InvizX fluorocarbon line, 5/0 Gamakatsu EWG SuperLine worm hook, Jackall Flick Shake 6.8 (junebug). > Light flipping gear: 7'6" heavy-action Shimano Expride rod, Shimano Metanium casting reel (8.4:1 ratio), 50-pound PowerPro Maxcuatro braided line, 1/4-, 5/16- or 3/8-ounce tungsten weight, same hook and bait. > Heavy flipping gear: 7'5" heavy-action G. Loomis E6X rod, same reel as light flipping, 80-pound Maxcuatro braid, same weights, hook and bait. Main factor in his success � "Not doing what I've done every other year down here, which was run around the whole time. I picked two areas within 2 miles of each other that I thought had the most fish, and I figured if I went through enough of them I'd eventually get some big ones. I just spent a lot more time fishing than I ever had before." Performance edge � "Definitely the Power-Poles and my Motor Guide trolling motor. The trolling motor took me through solid trees and without the Power-Poles, I wouldn't have caught anything in that wind." 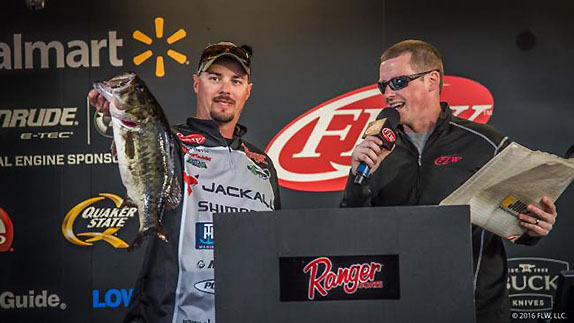 Canadian Chris Johnston logged a Top 5 in his FLW Tour debut. Chris Johnston, a tour rookie from Canada, likely would've been the runner-up had he not spent day 1 in the northern portion of the lake. "I went up north on the first day of practice and I caught one big one," he said. "I tried the south end, too, fishing what they call the hayfields, and that was more consistent, but I didn't think I could catch a giant bag. "You always hear about the south end � it's no secret. My brother (fellow Tour rookie Cory Johnston) fished there in the Rayovac last year and did okay, so I knew it was something I had to check. I knew what to look for, and that made it pretty easy." 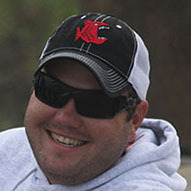 He was in 94th place after day 1 as his ill-fated trip north produced just four keepers. He catapulted all the way to 12th after heading the other direction on day 2 and just kept climbing from there. "I went down there just hoping to recover enough to get inside the Top 50 and make a $10,000 check. I was pretty surprised to get in the Top 20 and I ended up finishing much better than I thought I would." He flipped reed heads and pockets in the hayfields that were likely to contain spawning beds. He also tried throwing a spinnerbait, but that produced only smaller males � the females wouldn't come up to get it in the midst of a cold front. > Flipping gear: 7'11" G. Loomis IMX954 rod, Shimano Metanium casting reel (8.4:1 ratio), 65-pound PowerPro braided line, 4/0 Gamakatsu Super Heavy Cover hook, Reaction Innovations Sweet Beaver (black/blue). > "I don't think the bait had too much to do with it," he said. "I just had to put it in front of them." > Spinnerbait gear: 7'5" G. Loomis GLX894 Jig & Worm Casting rod, same reel (6.4:1 ratio), 30-pound PowerPro braid, 3/8-ounce Jackall Super Eruption spinnerbait (white with silver willow-leaf blades). Main factor in his success � "The biggest thing was just making the change from the north to the south after the first day." Performance edge � "I use the new Evinrude G2 on my Ranger and the dependability of that motor is great. I also have to give props to my Power-Poles because there were a couple of days when I wouldn't have even been able to fish without them." Michael Neal turned in a high finish despite a poor practice. Michael Neal never ventured to the fertile southern end of the lake. He spent the tournament in Eagle Bay in the northeast portion. 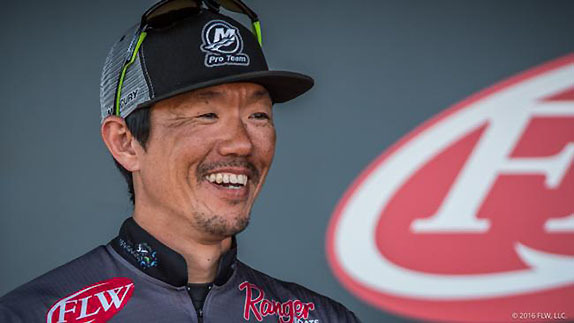 An unfruitful practice left him thinking that a finish somewhere around 50th place was the best he could hope for, but it turned out he was around enough decent fish to notch a Top-5 under the tough-bite conditions. "Every time I've been here I've fished that same general area," he said. 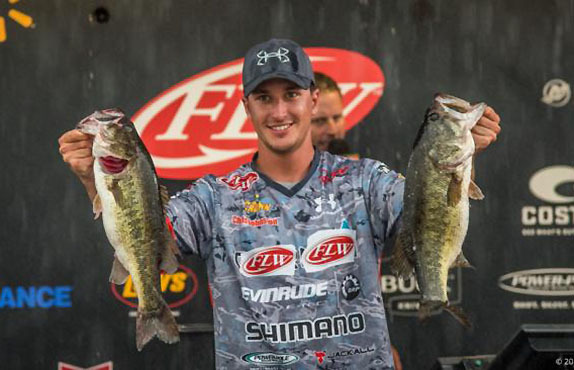 "I went through 3 days of practice and eliminated 95 percent of it, and I had one little area where the fish were grouped up. "It was the only hydrilla that was still there after all the rain and wind. I think that's why it was holding fish." He caught 17 of his weigh-in fish on a swimjig and the other three with a flipping stick. Flipping was totally unproductive for him over the weekend. "I tried it a little bit, but every time I picked (that rod) up I felt like I was wasting my time," he said. "That's not my strong suit, anyway." > Swimjig gear: 7'1" medium-heavy Cashion rod, Ardent Elite casting reel (6.5:1 ratio), 60-pound Sunline FX2 braided line, 3/8- or 1/2-ounce True South Custom Lures swimjig (black/blue), 4 1/4" Big Bite Baits Cane Thumper trailer (hematoma). > Flipping gear: 7'6" heavy-action Cashion rod, Ardent Grand casting reel (7.3:1 ratio), same line, 1 1/2-ounce Hawg Tech weight, 4/0 Gamakatsu Super Heavy Cover hook, Big Bite Yo Daddy (black/blue). Main factor in his success � "Staying put and fishing my strengths and not trying to do a lot of flipping or looking for beds." Performance edge � "I'm going to say it was the Cane Thumper. On day 2 I was sharing water with a guy and I was culling and he only had one fish. He was throwing a swimbait and he wasn't getting any bites. I trolled over and gave him four Cane Thumpers and he caught three fish in the next 30 minutes." Finesse expert Shinichi Fukae flipped his way to a single-digit placement. Finesse-fishing is Shinichi Fukae's game, but he proved in this event that he can get the job done with the big rod, too. He shared water in South Bay with Hallman and joked throughout the tournament that, at a shade over 5 1/2 feet tall, he was at a serious disadvantage to the 6-foot-5 Hallman in trying to play that technique under such blustery conditions. After day 1, his goal was to weigh a bigger bag than Hallman on one day, and he accomplished that on day 3 when the winner brought just four fish to the scale. "I found that spot on the first day of practice, in the last couple hours," he said. "I got a couple of real good bites and I never went back the next 2 days. I wanted to leave that area for the tournament." His flipping bite died on the final day and he had to resort to throwing a Senko to catch a miniscule limit and remain among the Top 5 (he started the day in 3rd). > Flipping gear: 7'10" heavy-action prototype Shimano Zodias rod, Shimano Metanium casting reel (8.5:1 ratio), 60-pound YGK Super Black Dyneema braided line, 1 1/2- or 2-ounce Fish Arrow Tungsten weight, 4/0 Gamakatsu Super Heavy Cover hook, Gary Yamamoto Custom Baits Flappin' Hog (black/blue). > Casting gear: 7'2" medium-heavy Shimano Zodias rod, same reel (7.4:1 ratio), 16-pound YGK N-Waker fluorocarbon line, 1/4-ounce Fish Arrow tungsten weight, same hook (5/0), 5" Gary Yamamoto Custom Baits Senko (black/blue). Main factor in his success � "I think I've fished here 11 times and I've had a couple good finishes, so I have some experience and confidence. I know what to do when the lake (level) is going down and when it's going up." Performance edge � "Power-Poles. The key for me was being very patient and fishing very slowly, and the Power-Poles allowed me to do that. Also my Lowrance unit � I have 1,200 waypoints (for Okeechobee) in there and even though the lake changes every year, some of them helped."